I’ve been working at a performance car parts company for the past two years and while I’ve come a long way since I started, I’ve still got a lot to learn. I now know what a camshaft is, and where it goes, and I don’t need to call a distributor a scepter like I once did. My lack of knowledge about types and years of cars is very far behind that of my magazine partner-in-crime, Shawn, who often says things like grab that image of the ’63 something or other for an article. Me: You know I don’t know what that is. 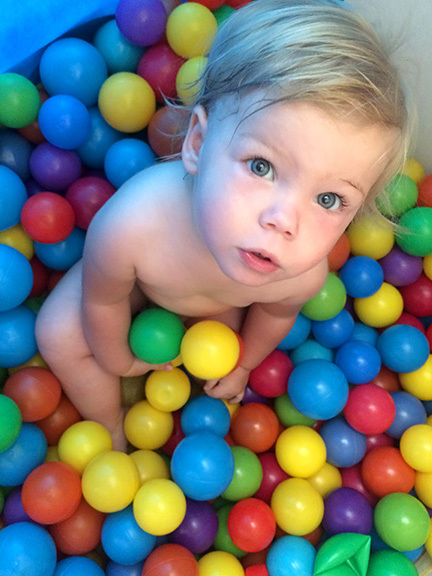 What color is it? Shawn: I’d think you’d have learned some of that stuff by now. Me: All I see are colors. 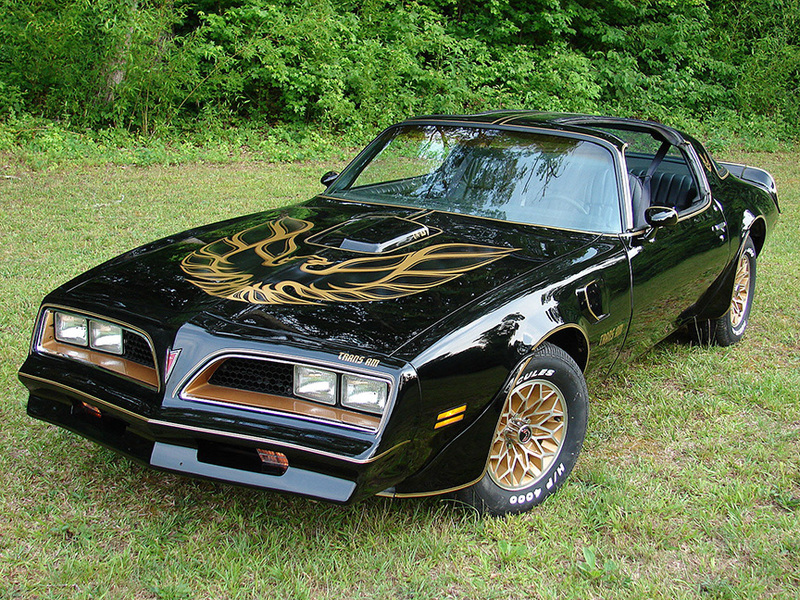 That’s mostly true, I really only notice if it’s a Bandit Trans Am – my favorite – and it drives Shawn crazy. When I win the lottery, this will be mine. On Memorial Day Tammy and I were flying back from visiting Ashlee, Billy, and our beautiful grandbaby Brooklynn, when our flight from North Carolina to Atlanta was delayed due to weather, which caused us to miss our connecting flight to Memphis. Delta put us up in a hotel for the night and rescheduled us on a 6:55 p.m. flight the next day. Since Memphis is less than a 6-hour drive from Atlanta we decided to rent a car instead of wasting all day at the airport. I was online booking a car with Avis and toyed with the idea of getting a sports car instead of the run-of-the-mill option. Tammy said she didn’t care, so when we got to the counter I asked if we could upgrade. 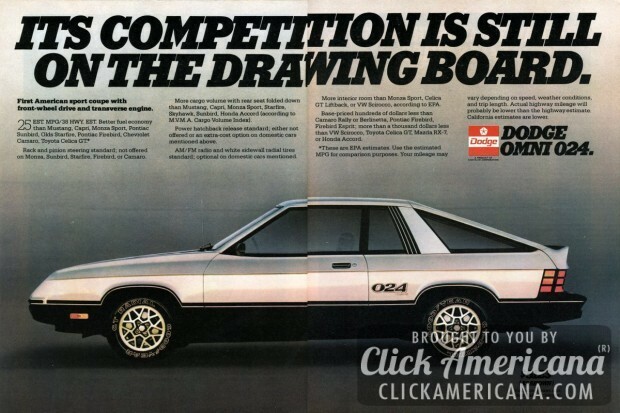 The closest thing to a sports car I’ve ever owned was my first car, a Dodge Omni 024, which hardly qualified as a sports car when it was brand new. There she is, in all her glory. It’s OK to be jealous. 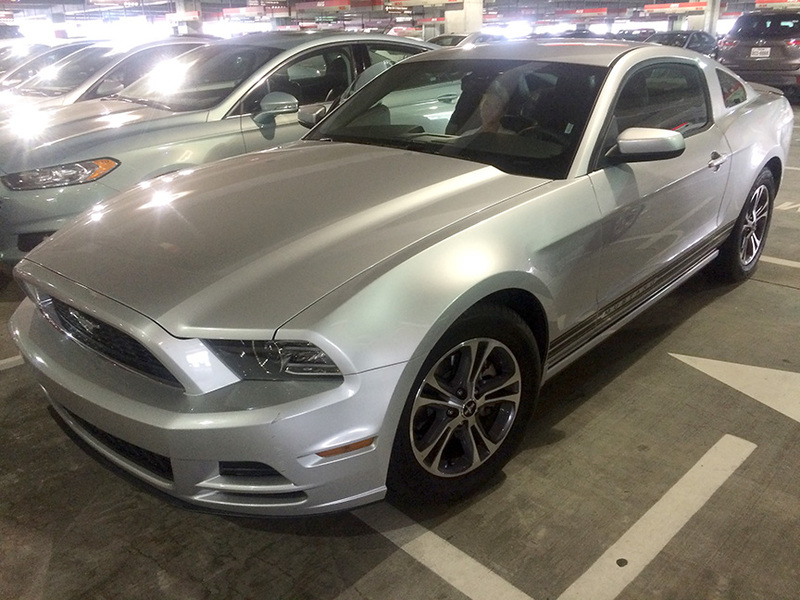 We were given a silver Ford Mustang and I’ve never been so excited to get in a rental car. It’s hard to tell in this picture, but Tammy was definitely NOT as excited as me. 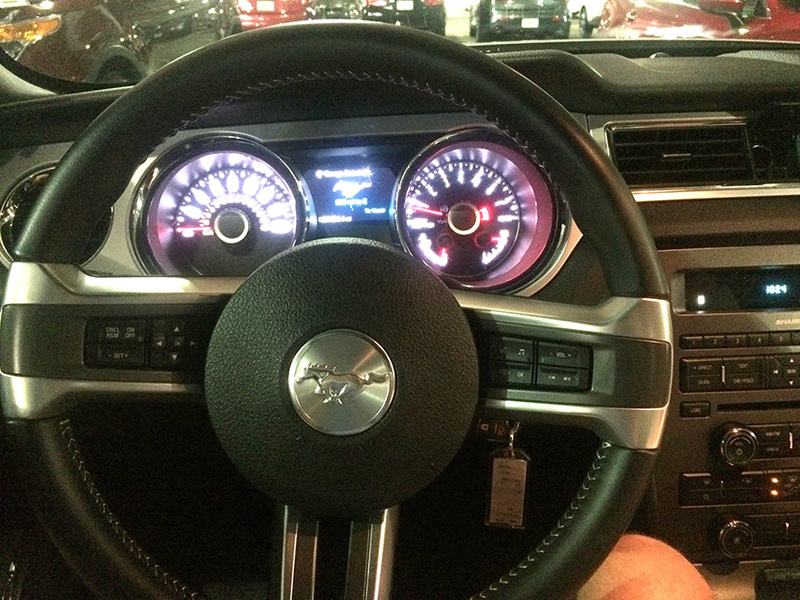 I had never been behind the wheel of a Mustang and was digging all of the modern bells and whistles this one had. It sat lower than what I’m used to, but I really didn’t have a problem with it other than not being able to really see the front of the car. But my view was still better than Tammy’s. She could barely see over the dash because she’s so short. 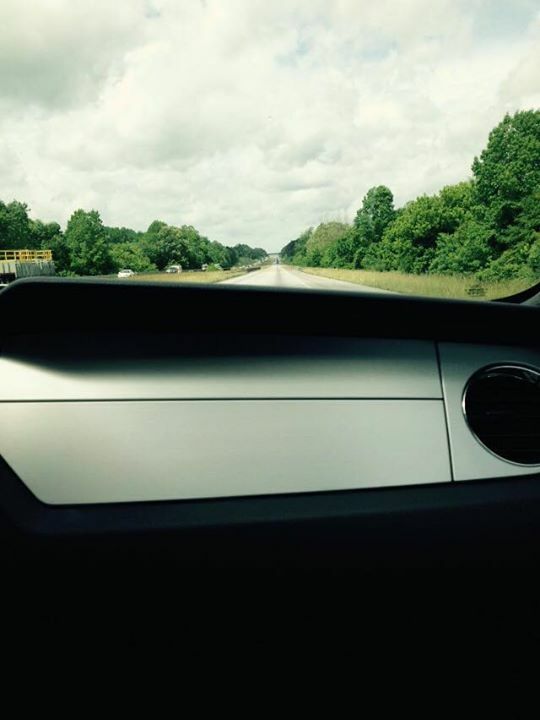 The actual view Tammy had from the passenger seat. Despite not being able to see very well Tammy was impressed with the smoothness of the ride. I was digging the Sirius satellite radio options we had and about an hour into our drive, I noticed a button near the shifter. 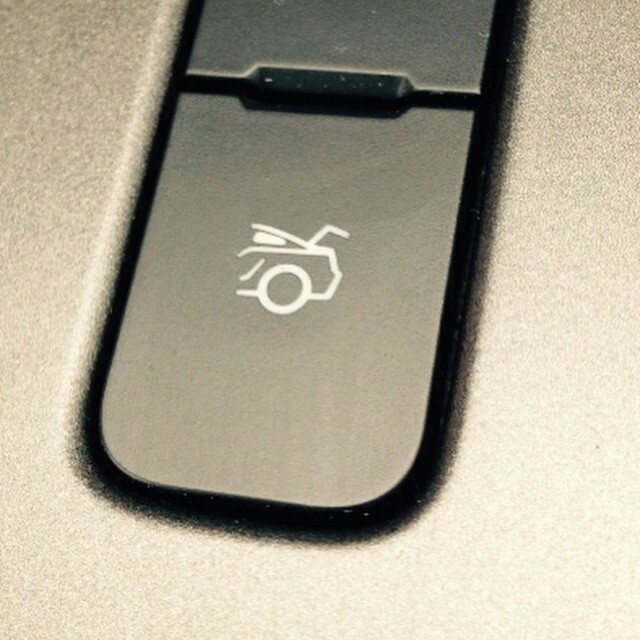 Me: (pushes it) This button puts my tailfin up. I’ve seen some cars with a spoiler that moves after certain speeds, so I’m thinking with all of the modern stuff in this car that this has to be an option. I push it again while looking out the rearview mirror in hopes of watching it happen. Tammy looks at the button and then looks at me. Tammy: Are you sure it doesn’t pop open the trunk? I could feel my jaw drop as I looked out the rearview mirror to make sure our luggage wasn’t bouncing down the highway. She laughed so hard she had tears in her eyes. I told you I still have a lot to learn. Gallery | This entry was posted in Daily Life and tagged cars, daily life, driving, family, humor, Mustang, people, Tammy, Travel. Bookmark the permalink.